"The story of two people who got married, met and then fell in love." 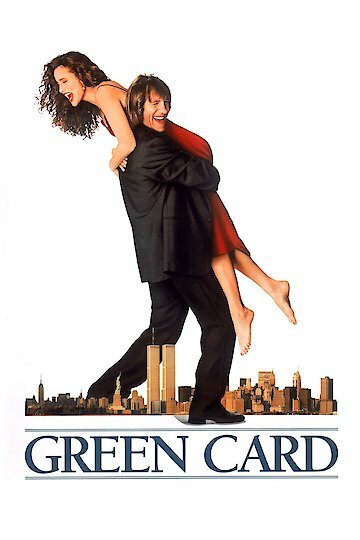 The plot of this romantic comedy centers on the fabricated marriage between Brontë Parrish, a straight laced New York environmentalist played by Andie MacDowell and Georges Fauré a short tempered illegal alien from France played by Gérard Depardieu. Georges and Brontë both have their own motivations for the arrangement, but this marriage of convenience proves to be far more than Brontë or Georges bargain for. Once this couple entangle themselves deeper into their marriage scheme, they find their lives being turned in all directions. Their difficulties are further heightened from the fact that they seem to detest virtually everything about each other. In this couple's many attempts to fool friends, parents and immigration agents, they find their short term scam far more engaging than they every thought it could be. This film, directed by Peter Weir, won a Golden Globe in the category of Best Motion Picture - Comedy/Musical and was nominated for an Academy Award. Green Card is currently available to watch and stream, buy on demand at Amazon, Vudu, Google Play, FandangoNow, iTunes, YouTube VOD online.